All aboard Jack Burton's Pork Chop Express! In a behind-the-scenes special back in the day, John Carpenter described his eleventh film as an, "action adventure comedy kung fu ghost story monster movie" and we couldn't have put it better. Here we'll take a look at 10 things you never knew about Big Trouble in Little China. Jack Burton carries his belongings in a saddle and wears those crazy boots, which makes sense, considering the character began in the Old West. Instead of looking for the Pork Chop Express, Jack would have been searching for his favorite horse. Big Trouble in Little China was first conceived as a Western, set in 1899 San Francisco. Burton brought meat to the Chinese workers who were building the railroad. The original writers described the tone as Indiana Jones meets Romancing the Stone. 48 Hours director Walter Hill passed on the script, which then went to Buckaroo Banzai director W.D. Richter. He rewrote and updated the setting to the modern day. Speaking of those crazy boots, they were actually Kurt Russell's idea. Released shortly after the movie's 30th anniversary, The Official Making of Big Trouble in Little China features a forward by Carpenter, an afterward by Russell, and tons of interviews. One of the things we learned from the book was that those moccasin style boots were custom made at a place Russell knew about in Aspen, Colorado. This boot maker isn't to be confused with Aspen's Boot Man, aka Brit Queer, a notorious Colorado local who takes money from illegal parkers, including some celebrities. He even put a boot on a car owned by Kurt Russell and Goldie Hawn. Carpenter super fans sort of have Dan Aykroyd to thank for the director's reunion with badass cinematographer Dean Cundey, who shot Halloween, The Fog, Escape From New York, and The Thing, but was absent for Christine and Starman. Cundey diplomatically put it down to conflicting schedules, but Carpenter was more forthcoming. "Dean and I did have some attitude problems on Halloween and The Thing," he told Starlog. The pair reconnected when Carpenter was attached to direct the action comedy Armed and Dangerous, a star vehicle for Dan Aykroyd, and met up with his old collaborator to discuss it. (Armed and Dangerous ended up getting made by Mark L. Lester, the director of Commando, with John Candy in the lead role.) "We had a better relationship on Big Trouble than we ever had before," Carpenter said. He may be in the middle of the poster, but Jack was really Robin, not Batman. In a 2016 Oral History put together by Entertainment Weekly, Russell said "The real lead was Wang [Chi]." As Carpenter explained, "Jack Burton is a guy who is a sidekick but doesn't know it. He's an idiot-blowhard. He's an American fool in a world that he doesn't understand." In the DVD commentary, Carpenter says the head of 20th Century Fox never wrapped his head around this, complaining that Burton wasn't "heroic enough." The opening scene was added to make Jack appear more heroic. Production was sped up on Big Trouble in Little China in order to get it into theaters before The Golden Child, which starred Eddie Murphy, already a massive star thanks to 48 Hours, Trading Places, and of course, Beverly Hills Cop. The Golden Child was written by a good friend of Big Trouble's original screenwriters and was once offered to Carpenter. "The films have a similar theme in that they both explore Chinese legend and magic," Carpenter said to Starlog back then. "Golden Child has a presold ingredient - Eddie Murphy. Big Trouble doesn't - so I had to make a better movie." Big Trouble was released in July 1986; Golden Child followed in December. Just as Big Trouble in Little China was one of the influences on Thor: Ragnarok. Carpenter himself took some inspiration from 1983's Zu Warriors from the Magic Mountain, which combined Hong Kong action with the supernatural. "It's basically the Chinese Star Wars," he told Starlog. "It's nuts - I've never seen anything like it." 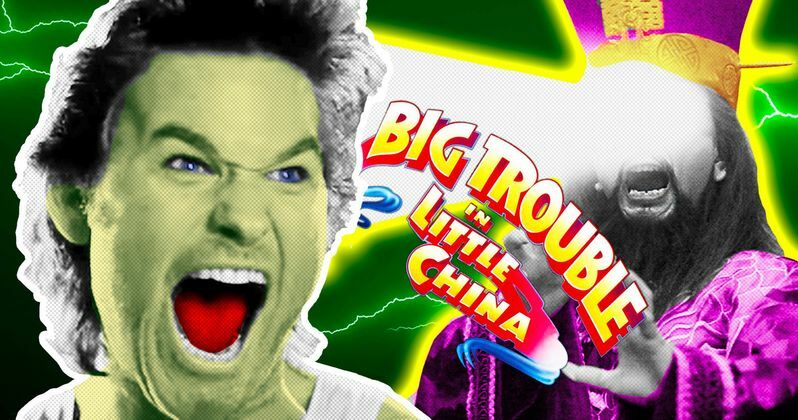 Like The Karate Kid, A Nightmare on Elm Street and plenty of other movies we love, there's an all but forgotten video game adaptation of Big Trouble in Little China. It was made for the Amstrad CPC, Commodore 64, and ZX Spectrum. The side scrolling game - which went from right to left - allowed players to fight as Jack, Wang, or Egg Shen. While its game tie-in wasn't a success, Big Trouble was a massive influence on one of the biggest games ever. We're talking, of course, about Mortal Kombat. We never got a sequel on the big screen, but Jack Burton's adventures continued in comic books, with Carpenter's fingerprints as a cowriter. In 2016, BOOM! Studios even teamed Jack Burton with Snake Plissken. The following year's Big Trouble in Little China: Old Man Jack saw Burton come out of retirement in the year 2020. We've also gotten some cool action figures, a board game, and a card game. Quentin Tarantino loves to pepper his movies with pop culture references big and small and Death Proof, his half of the Grindhouse collaboration with Robert Rodriguez, was no exception. Jack Burton's iconic t-shirt can be seen hanging on the wall above Jungle Julia's table in the Texas Chili Parlor. And the film's pop culture legacy continues, from Die Antwoord's "We Have Candy" to the 2012 "Lo Pan Style" parody video, to the Teenage Mutant Ninja Turtles character Ho Chan, who is of course Lo Pan in everything but name. He was even voiced by James Hong himself.